Available in 12 colors and 5 patterns. 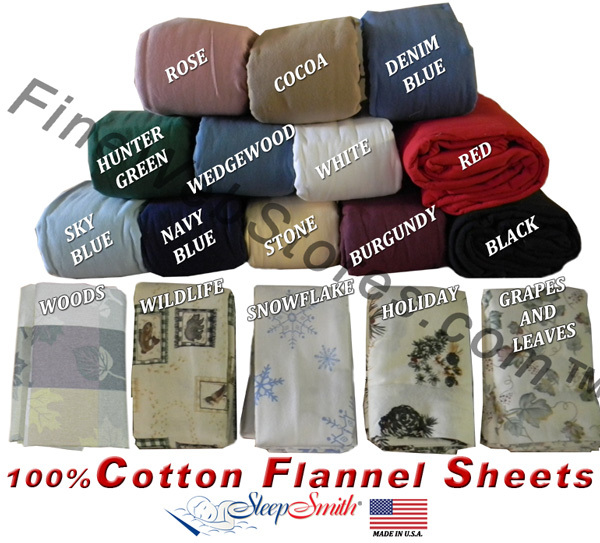 100% Cotton Flannel for warmth and care free enjoyment. Please choose your sheet color and mattress depth from the drop down menus above. Shipping Time: 95% of our orders ship with 15-20 business days. Please allow standard ground transit time depending on your location. Our comforters are quilted with bonded polyester fill in a contemporary tack and jump quilt pattern. The finished size of the comforter will be made to correspond with the mattress depth you provide us. The reverse side is matching. We also give you the option to choose between two mattress pads. The first being a quilted mattress pad constructed of cotton for added comfort. The fill is 100% polyester for some cushioning. There is stretchy material along the entire perimeter of this mattress pad for a sure fit. This pad lays directly on top of the mattress for protection. The quilted mattress pad is not waterproof. 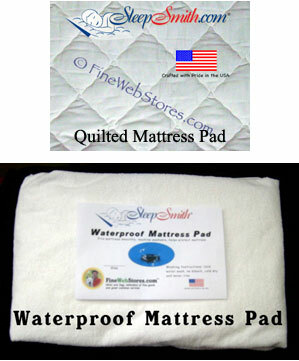 The other mattress pad has an innovative waterproof design. It is composed of two layers, the top layer is an ultra soft white terry cloth material and the bottom layer is a space age quiet pliable thin vinyl material. To give you protection without that rubber vinyl feel and noise. 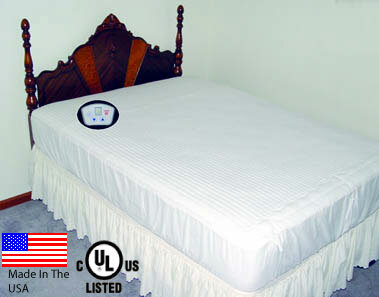 Select the Check Box to add the mattress pad you would like to add to your order. Easy to use heat control has ten heat settings for exact control. Quick warm up. Quiet operation. Automatic shut off after ten hours. Radiant from below relaxes tired back and legs, includes deep, restful sleep all night. Awake revitalized. Save energy! Turn your house thermostat down but stay toasty in bed! The mattress pad that the heater is built into is not water proof. The heated mattress pad is made of two sheets of fine weave, pre-shrunk poly cotton cloth, quilted together with bonded polyester fill in between. Plug into a normal house electrical outlet. Sewn in the USA! RETURN AND CANCELLATION POLICY: Please note that our sheets, comforters and mattress pads, etc. are all custom sewn for you when you order. We do this so we can offer many colors and custom sizes, thousands of combination's, in fact! Because our bedding is custom for your order, please order carefully. Cancellation of an order is generally impossible as we start sewing ASAP. We can only accept returns within 30 days of order, a 50% re-stock fee will apply, and the bedding must be in original packaging. Bedding that has been used or washed is not returnable. Please note that you are responsible for all shipping costs. Full XL size flannel sheet set and with optional matching comforter and mattress pad.